I’m in reflective mood today, so here’s some ideas on how to make a difference to the situation we find ourselves in regarding wrecking the planet. Sorry if this sounds a bit political, but it strikes me there’s a lot of small things we could do that won’t affect our lives much but might just help to save the planet. Or at least make it last until it doesn’t concern me – about 30 years should do. Go on holiday at home. A return flight between New York and London produces about a tonne of CO2. That means I’m giving up bacon sandwiches so you can have a holiday abroad? I don’t think so. Stop it! 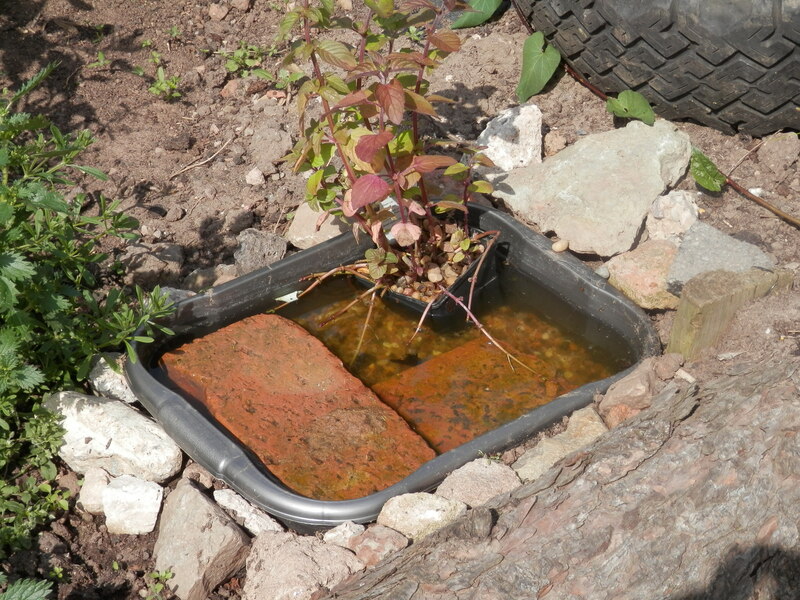 Build a wildlife pond (even a small one) – that’s my new enthusiasm this week. Don’t drive as far, and buy a more efficient car. We’re not all going to take to bikes anytime soon, not with my knees anyway, and the buses aren’t that good round my way so, being realistic, I need a car. It’s not too big, I don’t generally drive above 60, even on a motorway, and try to be economical in the way I drive as it saves money anyway. Do something else (lists really need 3 or 5 or 10 items I always feel).. It just needs to be a small thing, or a few small things. I recently stopped having drinking straws when eating in fast food places. That will save about 750 straws over the course of my life. It isn’t much, but it’s now got me thinking about reducing other plastic, and about the number of times i eat fast food (remembering I sometimes have tea, not soft drinks). That’s the depressing thing – I can actually find a lot of small changes to make and I’m only just starting to make them. I am, to be honest, a little bit ashamed of myself. 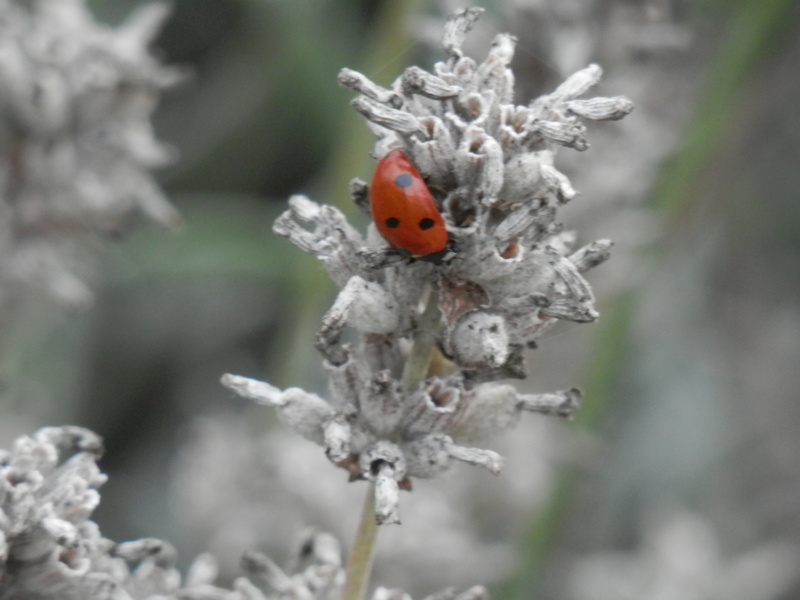 This entry was posted in Environment and tagged sustainability on August 29, 2015 by quercuscommunity. 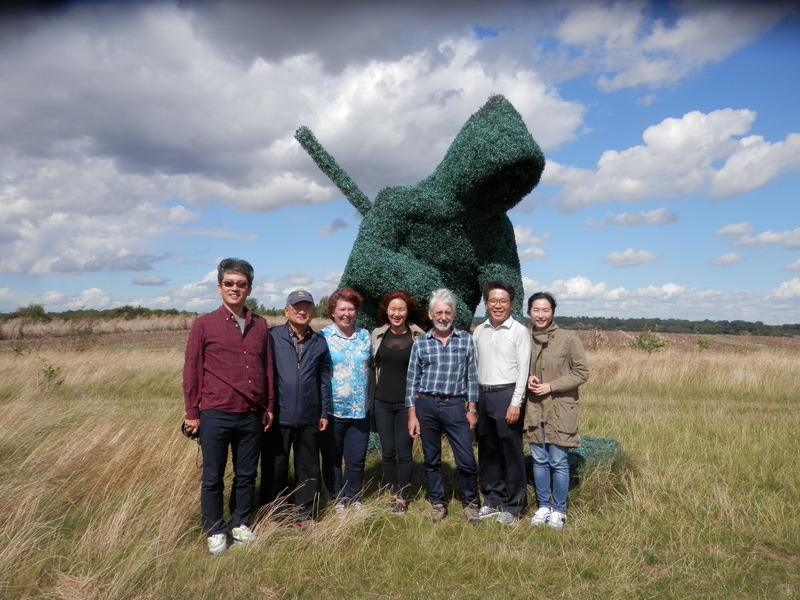 Yesterday we had a visit from Dr Jo Sempik, a leading academic in the field of Green Care and Care Farming, and five Korean visitors who were keen to know how the concept worked. I’m not sure that we actually know all the answers, or we’d be a lot better off, but we seemed to pass muster. This morning I had a steroid injection in the joint of my arthritic finger. I was just congratulating myself on zoning out the pain of having a needle inserted into my joint when the doctor depressed the plunger. I didn’t feel so pain free after that. It’s pretty good at the moment. 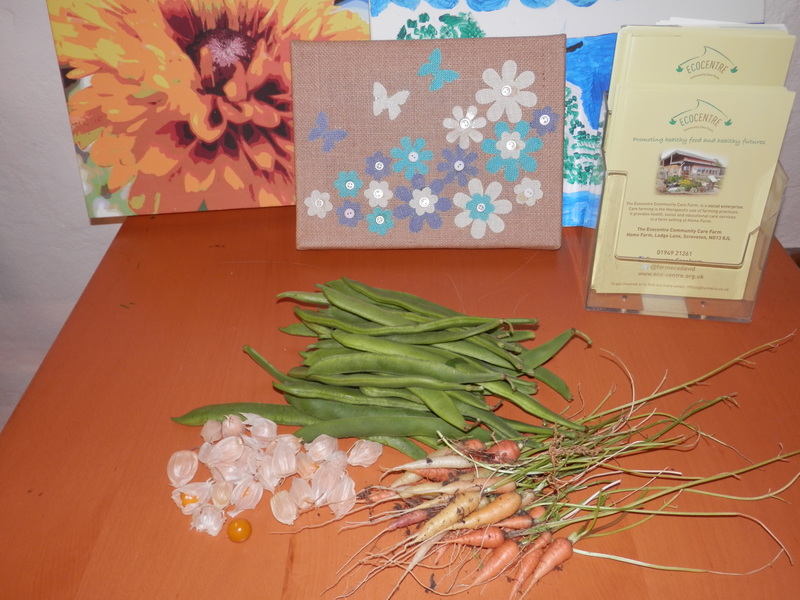 I’ve also been picking more of the harvest including my mini carrot harvest. I did mean them to be fashionably small but I might try to get them a bit bigger next year. That’s some of the group artwork in the background. Of course, there’s always a balance and today it came in the form of something that made my mind up about the way things have been going recently. So if anyone knows of a job that would suit a fat man with multiple useless skills and a bad attitude to customers let me know – I’m likely to have a few days to fill in the near future. I became self-employed because I didn’t like taking orders from idiots, but I’ll say no more. It is, after all, not a great thing to discuss in the sentence just after you’ve asked if anyone knows of any jobs going. This entry was posted in Care Farm and tagged arthritis, employment, Green Care, Korea, Shipshape Arts on August 28, 2015 by quercuscommunity. So there is was, isolated, disorientated and vulnerable in a small cubicle – presumably to make me answer all their questions. The Big Man with entourage came, then the gormless medical student and, eventually, the Bandage Nurse. I had an overwhelming urge to call her “Sister” on account of her air of authority. By the time she’d finished the bandaging it looked like I’d grown one of those comedy fingers you see in cartoons. You could imagine that if she removed the bandage the finger would pulsate and light up bright red. I humphed. It had now taken over four hours since cutting the finger and all I had to show for it was a bad attitude and a comedy finger. Did I mention which one it was? Shall we just say that passing Americans looked at me aghast, unsure of what they had done to merit such an insult. Anyway, they let me out of the claustrophobic cubicles and moved me to a chair in a dingy corridor with light-absorbing paint and a line of gloomy people that made American Gothic or Lowry look like tourist posters. Apart from one bloke, who was doing a passable impression of an idiot. His daughter smiled in embarrassment as she sat there, small, pale and clearly in pain. Then he went on to name all the local casualty departments he’d been to (many now closed) and all the uninteresting injuries he’s had. If I say he was the sort of man who remembers the names of consultants I’m sure you get the idea. “She’s put her hand in a riveting machine.” he said. If I’d have lived with him I’d have happily put my head in one. When he left, smiles broke out what had looked like a line of professional mourners suddenly looked like a line of contestants in The Price is Right, though one of them did have an offensively raised finger.. This entry was posted in Uncategorized and tagged A&E, American Gothic, finger, Hospital, Lowry on August 27, 2015 by quercuscommunity. It’s only a small pond – just a washing up bowl sunk into the corner of a raised bed. The plant in the corner is Water Mint. Most of the rest is gravel or bricks, which form steps to get out if anything falls in. 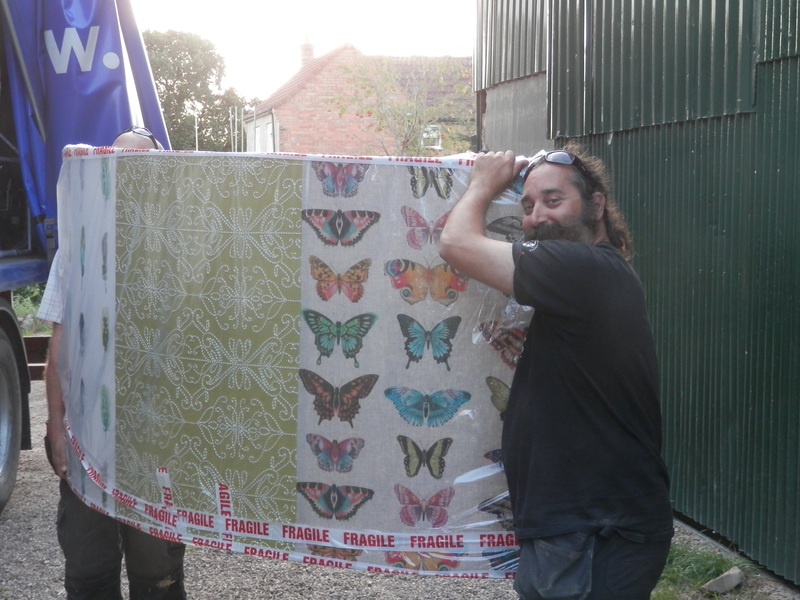 I think I’ve told you all this, but as you can see from the main picture we had our first dragonfly, a Southern Hawker. Not sure if it’s a coincidence or if the “pond” really worked. 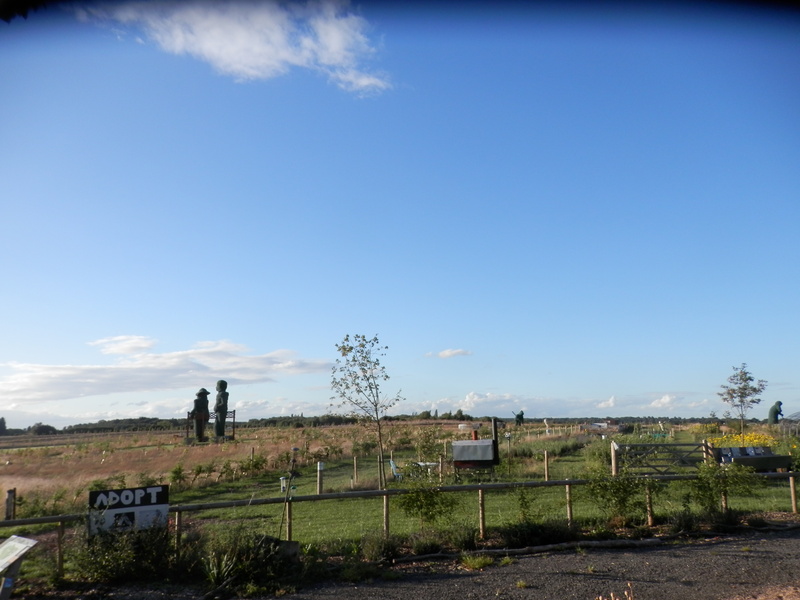 This entry was posted in Environment, Gardening and tagged nature, permaculture, pond on August 26, 2015 by quercuscommunity. We had several visitors today, with our fortnightly Lincoln contingent (who brought cake), Ibrahima (the exchange student), one of the ladies who staffs the cafe, and Dave, one of the Quercus directors. He’s been ill recently and has been confining his activities to doing admin from home. I’ll be sad to see him well again, as while he’s doing the admin I don’t need to, and we don’t have any trouble with mud from his tyre treads. Yes, I know it’s not very charitable but I never claimed to be a nice person. I suppose I’ll just have to get used to doing more sweeping. 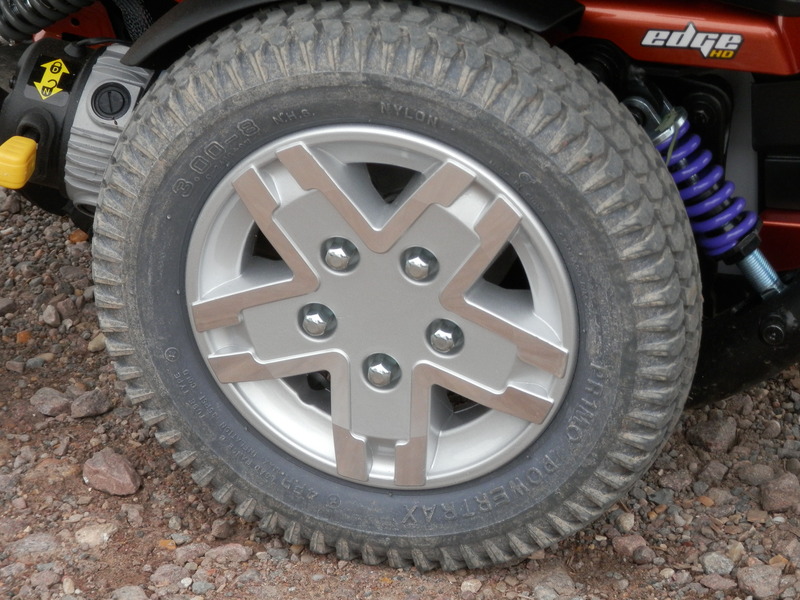 He’s had a new wheelchair since he last visited, a rather fetching chariot in bronze metallic with alloy wheels and purple shock absorbers. It wasn’t a great success to be honest, as he chopped up the edges of two doors before he got the footrests adjusted and then got stuck several times. To be fair, the getting stuck wasn’t all the fault of the chair. With an adventurous driver and poor surfaces you are going to get any chair stuck. 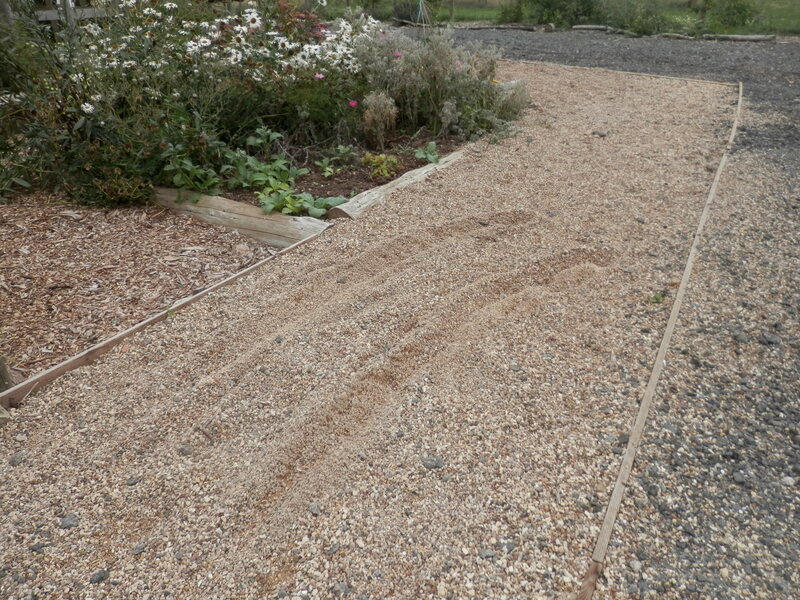 The fact that they use gravel traps to slow down crashing F1 cars should have been a clue that six inches of gravel wasn’t a good finish for a wheelchair path, but you know what builders are. The apples are looking good, and I’m looking forward to starting the pressing. However, we’ll need to do something about the wasps. With one nest in the sedum roof and one in the scarecrow by the back ramp it’s a bit tricky running the cafe, with several people being driven inside by the wasps this Saturday. Add nice sugary apple juice to the equation and you can see why I’ll be glad to get rid of them. I know we should live and let live but there are limits. 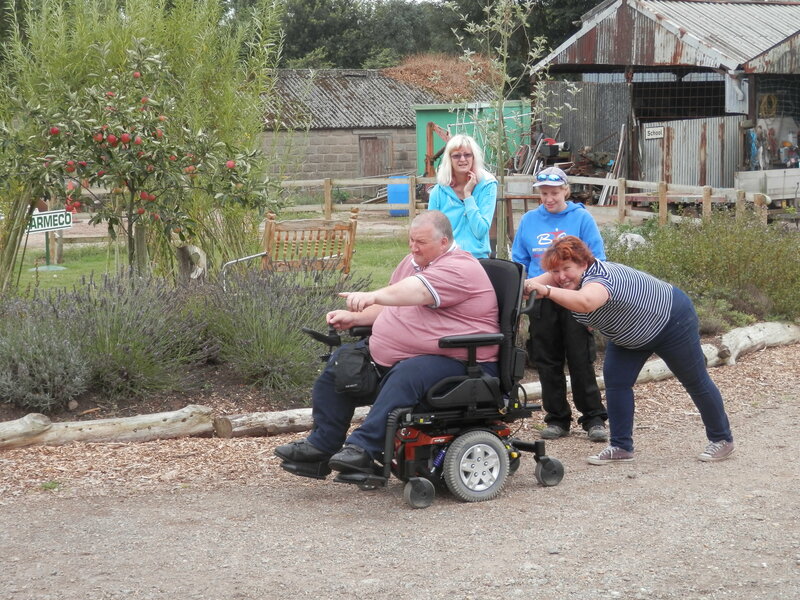 This entry was posted in Care Farm and tagged accessibility, wheelchair on August 24, 2015 by quercuscommunity. I’ve been writing about my arthritic finger recently, including a good helping of melodrama and a shameless bid for sympathy. However, this isn’t the silliest finger injury I’ve ever had. I was once trimming some leaflets for Julia using a steel rule and a Stanley knife. In order to do them more quickly I started making the piles of leaflets higher, pressing the blade down more firmly and cutting more quickly. After all, what could possibly go wrong? After spending a few minutes on The Stupidity of Husbands who Bleed on Leaflets (which would make a good title for a book on marriage) she decided I needed to go to hospital. The “Oh!” represents the noise I made when the force of the water peeled the top of my finger back and left it hanging by a thread of skin. It wasn’t a very big bit, no more than a quarter inch at most, and it didn’t hurt. First stop was the doctor. It wasn’t an emergency so hospital wasn’t an option. Wrong. Doctors don’t do stitches anymore and it apparently was an emergency. (As you can see from the fact I was later to go to hospital with a swollen finger I was to adopt this approach). There was a woman in the emergency department with skinned knuckles. That definitely wasn’t an emergency. How I scoffed. In fact I scoffed for ages because there was a long wait and I had not yet perfected my A&E skills. I now take a book, maybe two. And I don’t take a drink – you won’t enjoy it because you’ll worry about needing the toilet and missing your name being called. After two kids who did aikido and rugby I’ve become something of an expert at waiting. I was also, briefly, a bit of a legend in the dojo. They were all worried that I’d be freaked out by Number One son’s cut brow and bloody appearance, but calmed down when I said I intended going home to select a good book and have a nice cup of tea before going for a three or four hour wait. Eventually they took me through to a curtained cubicle where a man came in and asked when I’d last had a tetanus inoculation. I couldn’t remember so I had to take my trousers down. Yes, I thought it was a bit strange too, more like a game of Forfeits than a medical , though in the days before they all had ID badges you tended to believe that all people who gave you orders in hospital were staff. Fortunately he put my mind at rest by stabbing me in the leg with a needle. It was larger than the normal syringe they use so 25 years later I’m still left with a slight doubt in my mind as to whether he was a nurse or a keen amateur injector. This entry was posted in General and tagged finger, Hospital, ludicrous injuries, martial arts, stanley knife on August 22, 2015 by quercuscommunity.